And when he entered the temple, the chief priests and the elders of the people came up to him as he was teaching, and said, “By what authority are you doing these things, and who gave you this authority?” Jesus answered them, “I also will ask you one question, and if you tell me the answer, then I also will tell you by what authority I do these things. The baptism of John, from where did it come? From heaven or from man?” And they discussed it among themselves, saying, “If we say, ‘From heaven,’ he will say to us, ‘Why then did you not believe him?’ But if we say, ‘From man,’ we are afraid of the crowd, for they all hold that John was a prophet.” So they answered Jesus, “We do not know.” And he said to them, “Neither will I tell you by what authority I do these things. “What do you think? A man had two sons. And he went to the first and said, ‘Son, go and work in the vineyard today.’ And he answered, ‘I will not,’ but afterward he changed his mind and went. And he went to the other son and said the same. And he answered, ‘I go, sir,’ but did not go. Which of the two did the will of his father?” They said, “The first.” Jesus said to them, “Truly, I say to you, the tax collectors and the prostitutes go into the kingdom of God before you. For John came to you in the way of righteousness, and you did not believe him, but the tax collectors and the prostitutes believed him. And even when you saw it, you did not afterward change your minds and believe him. Obedience. What do you think about this word? It seems to be almost like a dirty word for Australian Christians. Don’t you dare to mention it to people who call themselves Christians. For being a Christian is all about … love. Right? Wrong! Obedience is a good word. A very good word. It is beautiful and joyful word, it comes full of promises and bearing rich gifts. Why would God require our obedience? What do you think? So that He could bless us. We know that He is merciful and gracious God, slow to anger and abounding in steadfast love, and whatever He commands us, He does is for our sake. When He demands from us obedience to His Commandments, He does it for our sake. How can parents bless their children, if they constantly disobey and wouldn’t listen to them? They can’t. Similarly, our God can’t bless us unless we obey and listen to His voice. And when we do, this is what obedience brings us. “All these blessings shall come upon you and overtake you […] Blessed shall you be in the city, and blessed shall you be in the field. Blessed shall be the fruit of your womb and the fruit of your ground and the fruit of your cattle. Obedience. It is a joyful word of blessing. And it is, according to the Bible, a word of love as well. Yes, you heard it right. 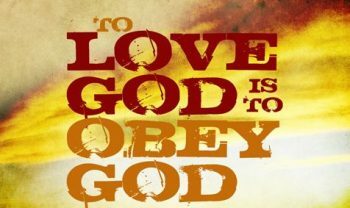 Obedience is a word of love. Do you know what the first commandment is about? Love your God with all your heart and with all your soul and with all your strength. So how do we do it? What does it mean very practically? Our church has forgotten it. We have been influenced by society around us where love is understood simply as formless and spineless emotion, that does nothing and cares for nothing. But how do we love our God? The Bible is very specific. The answer is what too many don’t want to hear. Obedience. How do we love our parents? When we listen to them and obey them. You can’t love them by not listening and disobeying. The same is true in our relationships with God. How good it is that it is revealed how to please our Lord, that we know what exactly He expects from us. We love our God, we respond to His love and grace and mercy by obeying Him and by listening to His voice. Too many who so called Christians don’t like this word obedience. It seems that many believe that you can love your God by disobeying Him and by not listening to Him. And see where it has lead us. The Church in Australia is flourishing. Right? Of course, not. The Bible is very clear, that where God’s people don’t listen to Him, and disobey Him the Church will perish. To put it in different words, where God’s people are not interested in listening and learning God’s Word in the Divine Service and in Bible studies, at home or in congregation, and where they are not interested in learning and keeping His Commandments, the Church will perish. We see it happening today. Can you see what their problem was? Yes, disobedience. They didn’t want to listen to John as God’s messenger or obey him. They didn’t want to listen to Jesus, the Son of God, or obey Him either. They wanted to do their own thing. Isn’t this a perfect description of Western Christianity? Many who call themselves Christians don’t want to listen when their brothers or sisters or pastors want to bring them closer to God. And they don’t want to listen to Jesus either. Instead, they want to listen and obey to … of course, to their own hearts. Maybe you thought that I was joking saying that many Western Christians believe that they should love God by not listening to Him and by disobeying Him. I wasn’t joking. This is what I have observed during these five years since we arrived. You probably know it better that I do, what many in Barossa who think they are Christians believe. You could summarize it like this. “I believe that there is a god”. Or sometimes they may even believe that there was this Jesus Christ, and that He had something to do with our sins and that all good people will go to heaven. And this is the shocking part. They also believe that if only they believe these things, they can ignore this God, they can disobey Him, they don’t need to listen to Him, and they basically can do whatever they want. That’s how many understand what it means to be a Christian. Do you see how blind our sin makes us? How can someone believe that, on the one hand, there is this God, and then, to conclude, that it means that I can do whatever I want. And once the conversation has gone that far, these people are quick to add, that they believe that they can be good Christians even without having anything to do with the Church, or with the Bible, or with this Jesus Christ. We all should be embarrassed. We all should be in fear and despair now. For this is also our fault. We have allowed this to happen. Worse, even today we often keep endorsing these lies. All is good. All is good. The Bible speaks clearly that to love God is to keep His Commandments. And do you know how the Bible calls not keeping the Commandments? It calls it – hating God. Those who don’t keep God’s Commandments, and even more those who don’t care about them – they hate God. It may not be how they call it, but it is how God calls it. How many of those who consider themselves Christians, or even members of our congregations know the Ten Commandments? Do we know the Ten Commandments and are we able to explain them to others? Because there is no way we can obey our God, if we even don’t know what is pleasing to Him, and what He expects from us. I think that it would be appropriate to tear off our clothes in despair and to sit in ashes, repenting of our disobedience and complacency, and to pray that the Lord is gracious to us once more and forgives us and shows us His mercy. How can any Christian think this way?! “I believe in a god, and therefore I can do whatever I want. And don’t you try to force me to do something I don’t want.” That is what pagans believe. That is not our Christiana faith. Not even remotely. Christian faith says: “I believe in you, my Lord and God, I know what You have done and do for me, and I value your gifts more than anything and therefore with Your help I want to listen to Your voice and I want to obey. I want my whole life to be pleasing to you.” The whole Christian life is about growing in obedience to our wonderful and loving Lord and Savior. About learning how to receive His blessings, and how to respond to this underserve mercy that He has showed us. The problem with obedience to God is not a problem of bad people. On the contrary, it is a problem of good people, of best people. Those were the best people in Jesus time, who opposed Him the most. Today they would be outstanding members in our community. They were so good, that they didn’t want to obey Jesus. They wanted to be good according to their own ideas. The same is true today. These are the good people around us, who get angry from the very idea that God may demand obedience from them. The obvious question is, what should we do about it? It is quite simple. First, we need to show them true love. That is, we need to tell them that they have been deceived or have deceived themselves. That their ideas about what being a Christian means lead them away from true God into eternal condemnation. It is not love, if we cowardly affirm their self-deceptions. It is hating them and leaving them captives of the father of lies. Then second, we are to show them with our lives and words and attitudes what a precious treasure and privilege it is to be a Christian. The Church is not of this world. This world will pass away, but the Church will remain. The Church is not of this world, this is where the eternal and holy God unites Himself to His chosen people. This is who you are, – God’s chosen people. Chosen not a few years ago. Not when you were born. No, chosen before the creation of the world. Already then the holy God knew that He will create you, redeem you, will give you His Holy Spirit, that He will bring you in His Church, His Body, and He will have you with Him forever. No one can earn this privilege. No one deserves it. God owes nothing to no one. You have been so blessed only because Jesus Christ, the Son of God was obedient, obedient to death, even death on a cross. But once you have been blessed to receive these precious gifts, adoption as God’s child and new life, you are to value them. More than anything. For that is the most valuable thing in our life. Everything else comes and goes, but if you have your Lord Jesus, you will have everything that He has. It also means that we should be ready to show with our lives that we do our best to love our God more than anything else. We have made our faith and God’s gifts look cheap and worthless. And who would need something that costs nothing and is worth nothing? You probably knew the fact that the Church grew rapidly during the first centuries. And it happened living in the culture that was hostile to Christians. From time to time there were persecution targeted specifically at Christians where many were murdered, because of their faith in Jesus. But that’s not all. People couldn’t just show up and demand to become members of the Church, get baptized and receive the Sacrament. In different places they had different practices, but it was common that to become a member of the body of Christ, people had to spend up to three years learning the basics of Christian faith. At the same time proving with obedient life that they are ready to become disciples of Jesus. They had to show that they understand, value and cherish the precious gift, – the saving faith and the eternal life, that is given to us as gift. How was this possible? To desire to become a Christian in culture that is hostile to Christians? To learn and lead obedient life for years before you are accepted in the Church. Why would anyone do it? Because the Church new what treasure it has and cherished it. She would not play games with people who had no interest in Jesus, or who were not ready to commit to Him. She didn’t have time for those who didn’t want to obey Jesus. What good does it do if we baptize 50 and confirm 50 and never see them again? Maybe we can learn from our history. Instead of having 50 whom you don’t see anymore, have 5 committed Christians and they will change the world. Jesus didn’t have hundreds or thousands, He only had twelve. We are now considering what kind of congregation we want to be. Let me tell you what I have been praying for. I pray that we are a congregation that is known for our love of God, as it is lived out in our obedience to God’s Commandments. That we strive to please God, instead of pleasing people. Our size doesn’t matter. Our age doesn’t matter. We may want to have more people, or more young people or whatever else. We can’t make it happen. You can’t make it happen and I can’t make it happen. The whole Christian Church together can’t make it happen. Because that is God’s blessing, the fruit of the Holy Spirit, and not a result of our efforts. Our Lord has promised to bless those who listen to His voice and obey His Commandments. This is what we can do. This is what we should do. I pray that we are a congregation, that welcomes sinners, that welcomes tax collectors and prostitutes, who want to obey our Lord, and ask good people to wait, until they are ready to obey our Lord. Obedience is a good and joyful word. It brings blessings. For individuals. For congregations, for community. For we know how much our Lord loves us and whatever He wills us to do is very good for us. Let us show our love to Jesus by being obedient to Him. Let this be our way of life. Amen. ← Our entire way of life is under attack: why vote “No”.